It’s certainly an exciting time to be in the world of mobile. With more and more accessible to consumers through their mobile devices and more functionality being shifted to the apps within them, it is distinctly clear that mobile has taken over. In fact, according to a recent study by eMarketer, mobile claimed about 70% of the total US digital advertising space in 2018. As marketers, there are many benefits to reap from a mobile-first ecosystem, including multiple revenue streams with in-app purchase, in-app ad and subscription revenues, in addition to a more personable channel for client relationship building. Not only this, but mobile is ever-present, far more than desktops have been to users in the past, and ultimately serves as the glue between the multiple touch points of the user journey. 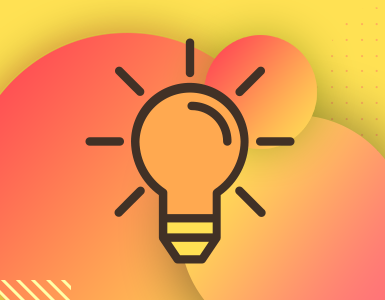 Of course, numerous challenges also present themselves in reaching mobile success, particularly fierce competition leading to broken organic discovery in the app stores, and the ability to acquire high-value users at scale who will engage with an app over time. In this kind of environment, data-driven user acquisition is becoming increasingly important. 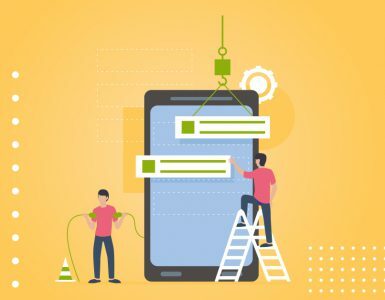 Indeed, apps are investing more and more resources to attract high-quality app users and foster long-term, multi-channel connections with them. 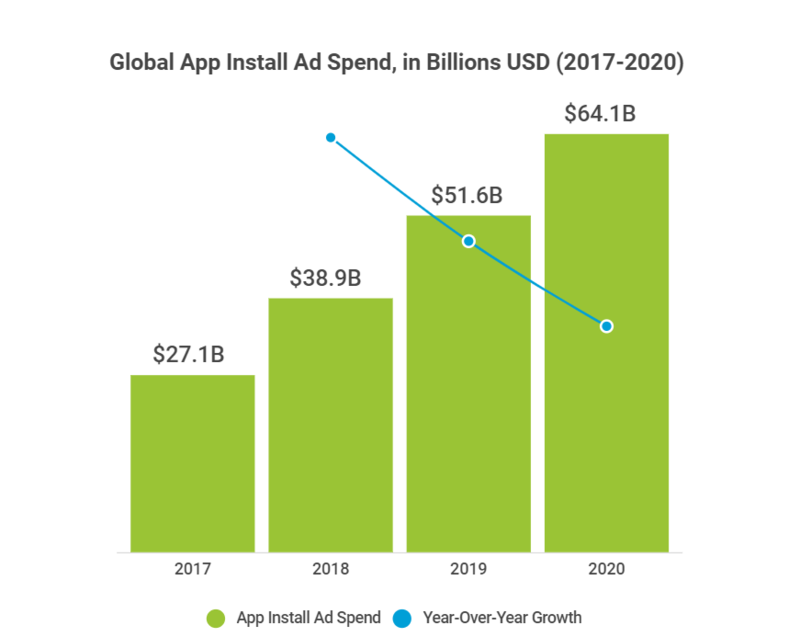 Global app install ad spend is predicted to climb by 65% from 2018 to 2020, reaching $64.1 billion. Year over year, this amount will grow by an average of 34% and gradually decrease with time, although growth will remain robust throughout this period. The higher cost of media, along with more paid campaigns, more apps, increased mobile use, and more users, has resulted in increased ad spend and will continue to do so moving forward. 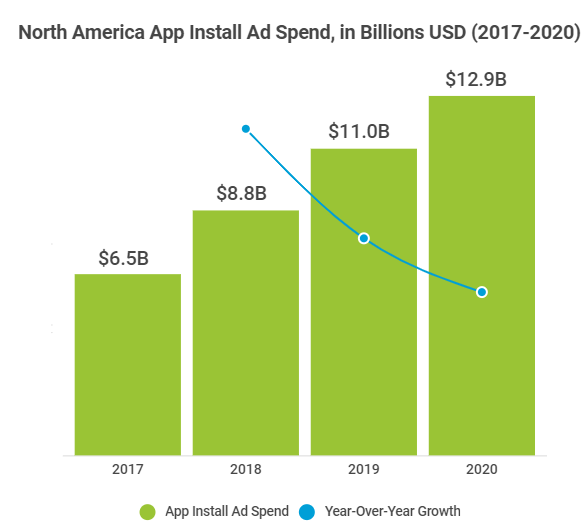 In one of the world’s most predominant app markets, North America, app install ad spend growth will also be pronounced, doubling by 2020 to hit $12.9 billion. Similar to what we can expect to occur globally, the average year over year change in this region will reach around 21%, meaning significant growth over a longer period of time. 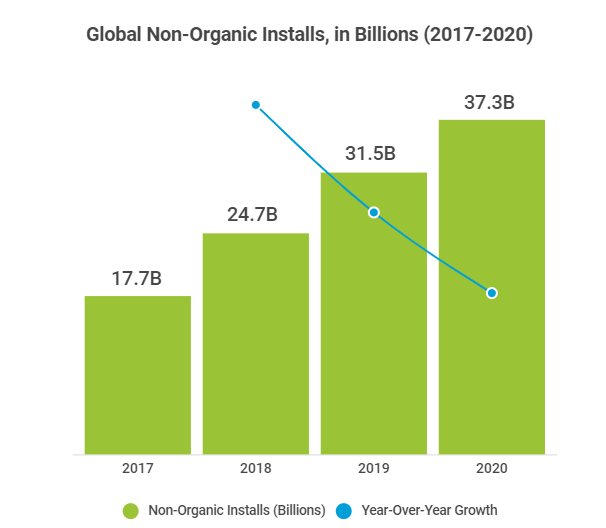 Although app installs ad spend is predicted to experience the greatest amount of growth through 2020, it is still important to monitor non-organic install trends in order to have the most well-rounded understanding of marketing-driven LTV potential. For that reason, it should be noted that, while install growth is significant between 2017 and 2020, this rate will not match the expected rise of media costs. From our data, global installs will grow by 110% into 2020, while North American installs will increase by 73%. 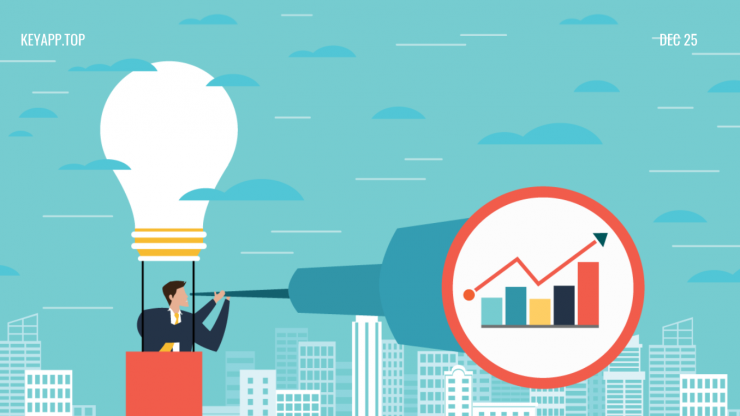 Bear in mind that, while both the ad spends and install growth rates maintain the same ratio through 2020, marketers will have to be increasingly efficient in their marketing efforts amid rising media costs. Why are we expecting mobile apps to grow? Gaming: The app economy is growing rapidly mainly due to, first, gaming and, second, shopping apps, which make up roughly 44% of all non-organic installs combined. Especially for gaming, which claims around 40% of the total app install pie, there is particularly staggering growth. 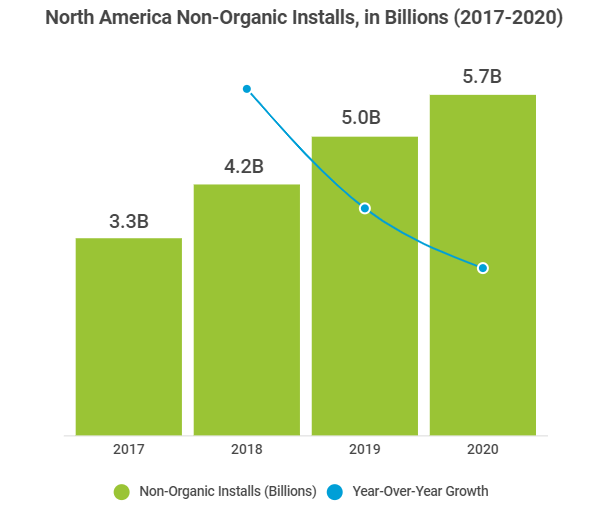 Between 2016 and 2018, the share of gaming non-organic installs in the pie grew by 26%, jumping from 27% to 34%. As one example, take a look at the gaming phenomenon of Fortnite, which is completely dominating in app store rankings, downloads, and revenue. It’s almost a cultural phenomenon and goes to show how prolific gaming as an app vertical is becoming as a whole. Powerful devices: On the hardware side of things, newer devices are being released that remain powerful and supportive of more sophisticated and immersive gaming experiences, as well as much more affordable. These devices also offer greater storage space on average, which, especially in developing countries, means there will no longer be a de facto limit on the number of apps one can have on a given device. Video and music streaming apps: This form of content consumption is rapidly growing rise, including giants such as Netflix, HBO, Hulu, and Spotify, among others. This is likely due to stronger devices, affordable data packages, and the emergence of stronger cellular infrastructures like 4G and 5G that is able to support it with greater flexibility and bandwidth. These trends are already evident and we expect them to continue moving forward. It’s no surprise – the mobile ecosystem will become even more competitive than it already is. That’s why marketers should become much more data-reliant to get that competitive edge they need. As marketers reap the benefits of thoughtful marketing strategies and revenue increases, fraudsters will also continue to vie for a piece of the pie. Ongoing protection is, therefore, a top priority. Apps doubling as ad publishers in addition to their own functionality will have ample opportunity to take advantage of the growing ad spend to generate more revenue from their app’s ad real estate. Due to the complex nature of these predictions, we used 5 different statistical models in order to calculate the above future trends. These models included Support Vector Machine (SVM) and K-Nearest Neighbor. Our results primarily came from AppsFlyer’s own data, which included 35 billion installs, $10 billion in ad spend, and 70,000 apps in the sample. We also used other parameters, such as 3rd party mobile attribution market share data, CPI prediction per region, number of apps in the app stores, and the number of installs. After the initial data collection, the entire set was divided into the following two categories: the attribution market share of non-organic installs (excluding Firebase and Facebook analytics for apps) and the non-attributed market (marketing-driven installs that were not measured through a mobile attribution provider). Note that this division was not shown in the report above, but was a factor in the overall methodology. 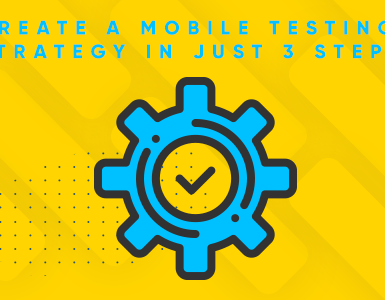 Create a Mobile Testing Strategy in Just Three Steps!